The DS2015xs falls somewhere in between the SME and more demanding mid-range business storage market, and as a result will sell mostly to a niche audience able to accept the inevitable compromises. Marketed as a medium-sized business solution, the 8-bay DiskStation DS2015xs from Synology is a very scalable NAS appliance which, when teamed with an optional 12-bay expansion unit, has an impressive raw capacity of 120TB. It also stands out due to its ARM-based quad-core processor which, although unusual on this class of NAS, has a decent enough spec and also provides the support needed for 10GbE fibre connectivity via a pair of SFP+ transceiver ports. Designed to sit on a desktop or shelf, Synology's new NAS shares the same very robust 8-bay chassis as the DS1815+ aimed at small business customers with disks mounted in plastic carriers that slide into hot-swappable slots at the front. There's no door to protect the disks, but you can lock the carriers in place to prevent accidental removal and fit your own choice of 3.5-inch and/or 2.5-inch SATA drives, as required. Disks aren't included in the base price of around £960 inc taxes (around $1,480, AU$1,900), but most SATA products can be accommodated including both 3GBps SATA II and 6Gbps SATA III drives. 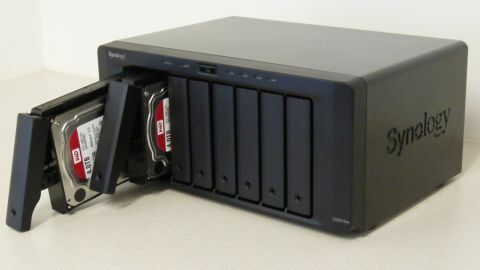 We tested using 4TB WD Red disks but newer 6TB disks can be used to further boost capacity. You can also opt for solid state disks with a useful caching option that uses just a couple of SSDs to improve storage performance without overly restricting capacity or breaking the bank. Expansion beyond eight disks requires an additional 12-bay DS1215 expander unit, which we found selling for £877 inc taxes (around $1,350, AU$1,740), again, without any disks inside. This attaches via a high-speed Infiniband cable to a port on the rear of the NAS, above which are two copper Gigabit Ethernet ports for network attachment plus two SFP+ slots to take 10GbE fibre optic transceivers. These clearly have to be factored into the price and can be costly. The cheapest transceivers (able to transmit over 300m fibre links) sell for around £120 inc. VAT (around $185, AU$240) each, plus for NAS sharing you'll also need a compatible switch or a direct-attach cable with built in transceivers if attaching the DS2015xs to a single system. A pair of USB 3.0 ports for backup drives complete the line-up of external interfaces while cooling is handled by a couple of large diameter fans which we found very quiet. Note, however, that there is only one, built-in, power supply on this particular NAS which seems a little at odds with the high-availability RAID storage and network failover capabilities. The processor in the DS2015xs is a little unusual in that it's a quad-core Alpine AL-514, an ARM-based SoC (System on Chip) from Israeli startup Annapurna Labs. Clocked at 1.7GHz the AL-514 is a 32-bit processor able to address up to 8GB of DDR3 RAM, although only 4GB is supplied as standard and there's no ECC support. It also provides the 10GbE interfaces needed to drive the SFP+ fibre ports and can also offload some RAID and encryption processes to optimise performance. Just like Synology consumer appliances, the DS2015xs is installed and configured remotely via a web portal with the latest DSM (DiskStation Manager) software downloaded as part of the process. It's then a matter of logging on to the DSM desktop interface and configuring storage, network and file sharing settings as required. We configured three disks as a Synology Hybrid RAID (SHR) array giving us an array able to tolerate a single disk failure. This is the easiest option when it comes to expanding capacity and what a lot of customers will choose, although you can opt for a standard RAID configuration if preferred, including RAID 6 with 2 disk redundancy. We then created a shared folder and ran the ATTO disk benchmark from a couple of PCs each routed to a specific Gigabit port using VLAN technology. Using this setup we were able to saturate the available bandwidth on the two Gigabit connections, simultaneously recording peak throughput rates of 118MB/sec for both read and write operations – about as much as you can expect on a Gigabit link. The processor copes well with this kind of load. We then checked out the 10GbE performance by attaching the NAS to a Windows server using fibre transceivers and a D-Link switch. With just a single port, this arrangement resulted in read/write rates of around 980MB/sec using a NAS file share. When we switched to an iSCSI volume, however, that fell to around 800MB/sec for reading and a disappointing 450MB/s when writing data, most probably due to lack of processing power.